"Then Herod, privately calling the wise men, learned diligently of them the time of the star which appeared to them;"
I am going to make a statement now and will try to prove it later: The star had appeared in the night sky sometime before the wise men appeared in Jerusalem. Remember that they made the trip by camel-not by jet plane. It is a long, hard trip by camel! I am of the opinion that they didn't arrive in Jerusalem until at least a year after the appearance of the star. This wasn't just a little Christmas celebration for them. As they traveled the long, weary miles, they had been hanging on to the hope of seeing Him and presenting their gifts to Him. Notice that Herod inquired "diligently" the time of the stars appearance in the sky. Keep that in mind. It will be an important fact later in the story. "And sending them into Bethlehem, said: Go and diligently inquire after the child, and when you have found him, bring me word again, that I also may come to adore him." He's being subtle as an old serpent, and that's exactly what Herod was. Suppose he had said, "If there's a king born around here, I'm going to get rid of him," and then had sent soldiers down to Bethlehem. I can assure you that he would never had found the child because he would have been hidden. He knew that the clever way and the bestway was to let the wise men go down and find the child and then come back and tell him. He said he wanted to go down and worship Him, but of course what he really wanted to do was to kill Him. "Who having heard the king, went their way; and behold the star which they had seen in the east, went before them, until it came and stood over where the child was. And seeing the star they rejoiced with exceeding great joy." Now the star appears again. I think they must have traveled a long time without seeing the star. That ought to answer the nonsense one hears today about their being a convergence of certain stars that happened at one particular time. 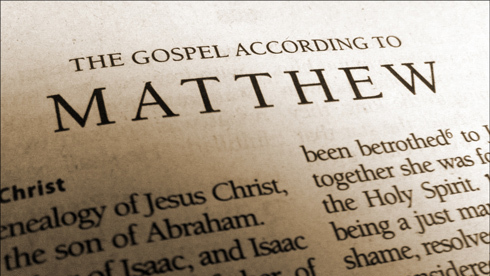 St. Matthew makes it very clear that this star was a very unusual star; in fact, it was a supernatural star. It was miraculous, and we needn't try to find an explanation for it. Now, it might be , as many astronomers think, that there was quite a movement in the heavens at that time. When he came, heaven and earth both responded to His coming into the world I think such things did take place, but the wise men saw a supernatural star. "And entering into the house, they found the child with Mary his mother, and falling down they adored him; and opening their treasures, they offered him gifts; gold, frankincense, and myrrh." When they arrived, Jesus was not in the stable. The great movement of people in the city of Bethlehem had now all ceased. They had gone back to their homes because the enrollment was over. But this little Baby was newly born, and they couldn't move him for awhile. It is possible that such a trip for the Little One would have jeopardized His life. So they had stayed in Bethlehem and had moved into a house. The wise men found them in a house. Again, the Christmas cards show the wise men coming into the stable. Well, unless St. Joseph pointed out that stable to them, they never even knew where it was. They came to the house. Please note that when they saw the young child with Mary His mother, they fell down and worshipped Him. If ever their was a time when Mary should have been worshipped, this was it. But they did not worship her- They were wise men. They worshipped Him. and presented to Him their treasures: gold and frankincense and myrrh. Now do not get angry with me for what I just said. Protestant and other Christians outside of the Catholic Church wrongly say that the Catholic Church teaches that we should worship Mary. And although they are wrong about that, there is some grain of truth in what they say. There are some in our beloved Church that do just that. There are those who put her on the same level as God with there attitude and practices sometime. You never see Mary in scripture standing in the limelight. She always was in the background serving Her son and others. "As a Catholic, We are so blessed to be a member of the Church that truly honors and respects the Mother of our Lord and Savior. Before those outside the Catholic Church accuse us of worshiping Mary, I ask you to take a long hard look at five facts. They have a way of poking holes in the theory that we place too much emphasis on Mary. If you still want to accuse Catholics of worshiping Mary, then I suggest you ignore these facts! Why, while struggling to speak as He hung on the Cross, would Jesus have spoken these words if they didn’t mean anything? Could He have been making small talk? Obviously, there was a reason that Our Lord did what He did. The Church has always believed that John represented each member of the Church and that, from that moment on, Mary became our spiritual mother. Scripture tells us that, on that day John accepted Jesus’ gift and “And from that hour, the disciple took her to his own.” (John 19:27). Shouldn’t we do the same? Although Jesus Christ is the sole mediator between God and man, that doesn’t preclude others (including Mary) from being involved in a subordinate mediation, or intercession. Saint Paul, who made the above statement, is obviously aware of that fact since he several times urges his readers to mediate and intercede in prayer for each other (Romans 1:9, 1 Thessalonians 5:25, 1 Timothy 2:1). This type of intercession is a participation in the intercession of Christ and is put into practice each time we pray for one another. Asking Mary to intercede for us in no way takes away from Jesus’ role as mediator between God and men for our salvation. "The multitude of camels shall cover thee, the dromedaries of Madian and Epha: all they from Saba shall come, bringing gold and frankincense: and shewing forth praise to the Lord." What gift is left out at His second coming? Myrrh! They do not bring Myrrh because that speaks of His death. when He comes the second time, nothing will speak of His death. Gold speaks of His birth. He is born a King. Frankincense speaks of the fragrance of His life. Myrrh speaks of His death. All of this is indicated in the gifts that were brought to Him at His first coming. But at His next coming myrrh will not be brought to Him. The next time He comes, He won't come to die upon a cross for the sins of the world. He will come as King of Kings and Lord of Lords. The Wise men had assumed that Herod was sincere and wanted to come down and worship Him. However, he would have killed the Child had not an angel of the Lord warned the Wise men to back to their own country by a different route. They may have continued south down to Heron, then crossed over south of the Dead sea, and thus they would be out of the range of Herod altogether. Next week we will discus the Flight into Egypt that the Holy Family had taken.